Oscar Resort located near Kyrenia new harbor with a seafront location surrounded by botanic garden and palm trees give a warm and cool atmosphere. 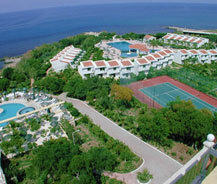 It is just 35 kms from Ercan Airport and from Larnaca Airport it is about 100 kms. Also from here city center is at a walking distance which is reachable at fifteen minutes. This resort is gifted with beautiful scenery of Mediterranean Sea on one side and the Five Fingers Mountain on the other side. This resort advertise themselves as second sweet home as it include facilities like Aqua Park, Wave Pool, Health and Fitness Club, Sauna, Jacuzzi, Gym, Indoor & Outdoor Swimming Pools, and various restaurants and bars. This resort includes various types of rooms such as Standard Land View Room, Standard Sea View Room, Suite Rooms, King Suite Rooms, Mini Villas, Apartments Gallery Rooms, and Pink Court Apartments Studio Rooms. All these rooms have various facilities satellite TV, mini bar, kettle, direct telephone line, hair dryer, safe box, electronic door lock system, air conditioning, smoke detector, and balcony these things are common in all kind of rooms other than that each room incorporates special things as their choice of rooms. All these facilities make it popular among holiday guests and all kind of people are always welcome to Oscar Resort.